I have recently obtained a very interesting board as scrap but with the proms (2 x 512 bytes) intact that I managed to dump. I intend to collect as many versions as possible in the driver and also support other designs from Didact: the Esselte 100 (BASIC) and Candela (OS9 etc) computers but they are more regular CRT/Keyboard based systems so no worries there. Now, is there some system in MESS already similar to the Didact mp68A or "Mikrodator 6802" as it was named later? 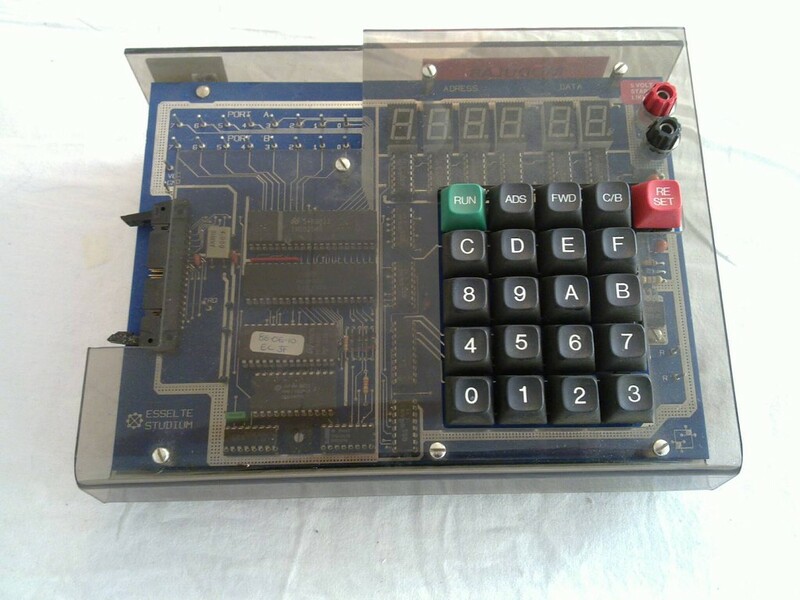 Especially the keypad and the BCD display is of interest to emulate so any pointers is appreciated. There are a few of those systems already in MAME. For example, the Synertek Systems Corp. SYM-1 or the MOS KIM-1. I have traced the keyboard now, it uses two 74LS148 and a 74LS00 aggregating a keypress into a three bit respons (PB0-PB2) to a three bit pattern written (PA4-PA6) aggregated through a transistor circuit that pull CB1 low on the PIA6820 when a key is pressed. I have also checked the other hexpad implementations such as kim1, sym1 and tec1. They all seems to use the device timer to interrupt the PIA on a layout interactions, eg I click on a key on the artwork. Is this the way to do it? The artwork being polled? There is no artwork call back that can be installed from the driver that can be called when I click? Last edited by Edstrom; 12/28/15 08:45 PM. Last edited by Edstrom; 01/05/16 05:06 PM. Let me know how it works if you test it. I know about the keyboard lag in md6802 but the mp68a should be fine. What happens if two devices present data on the data bus at the same time? I think this is what happens here in the Esselte 100 keyboard i/o design and I am trying to figure out how to get the right result our from the operation. Presumably a low dataline sinks a high dataline so I get a kind of fast scan? 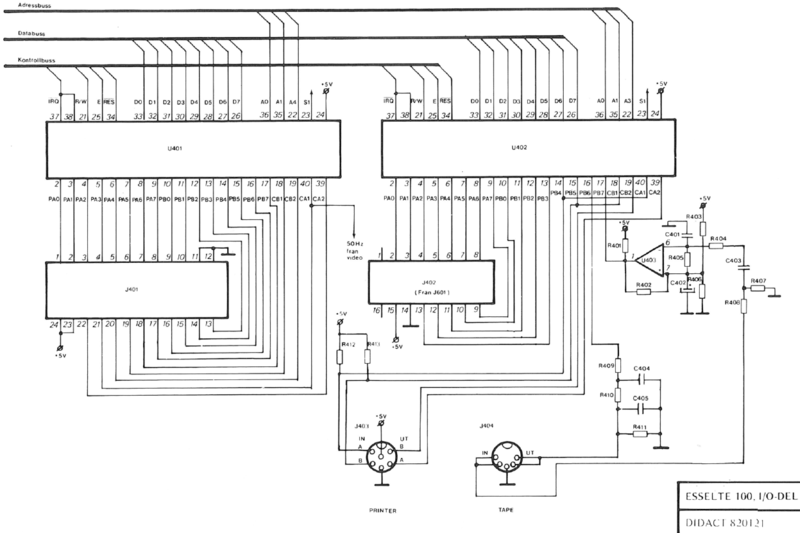 The circuit diagram has two PIA:s on the same chip select S1 which is the Y1 output from a 74138 when (A15=1, A14=1, A13=0, A12=0, A11=1) in the C8xx adress space. The neat detail is that the first PIA is selected by A4 and the second by A3, on PIA pin 22, which means both can be addressed at the same time! This makes sense for writes setting up both PIA:s with the same data driven by the CPU. But how will a read work when the 6820 PIA:s drives the bus and is it/can it be supported by MAME? The documented memory map says PIA1 is at C808-C80b and PIA2 at C810-C813 so I was puzzled by this startup code. Appreciate some insights on this.